Antique Needlework Tools – An Auction worth Browsing! For your weekend viewing pleasure – in case you’re stuck inside in snowy weather, or trying to escape the summer heat in the Southern Hemisphere, or just in the mood to browse some photos of exquisite needlework tools of the past – check out this upcoming auction of antique needlework tools at Theriault’s! 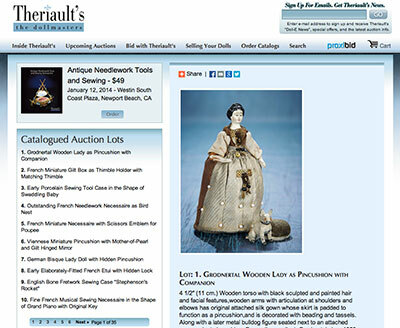 Theriault’s is an expert appraisal and auction firm for antique dolls, so most of their auctions deal with dolls. But this particular auction for the Hanne Buktas Collection of Antique Needlework Tools and Sewing Accessories is what caught my interest and had me glued to the computer screen for quite a while. It features unique and truly beautiful tools, boxes, etuis, needle cases, pin cushions collected from European estates. The auction takes place January 12 in Newport Beach, California. If you’re a keen collector and you want to bid, you can, of course, bid online as well. But for most of us, viewing the items is about as close as we’ll get to them. And they are fun to view! I’ll highlight a few pieces that caught my eye – and, with almost 350 pieces in the whole auction, there’s plenty to catch your eye, too! 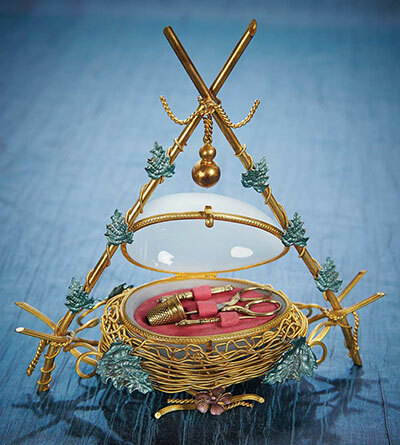 This gilt bird’s nest necessaire graces the cover of the catalog. Nestled within the translucent, hinged glass egg are scissors, thimble, awl, and needle. 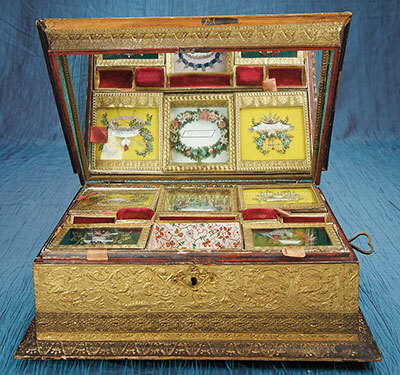 This musical sewing box is decked out in embossed gilt papers, sports a mirror and removable trays, and contains many little treasures, including a little embroidered friendship card. 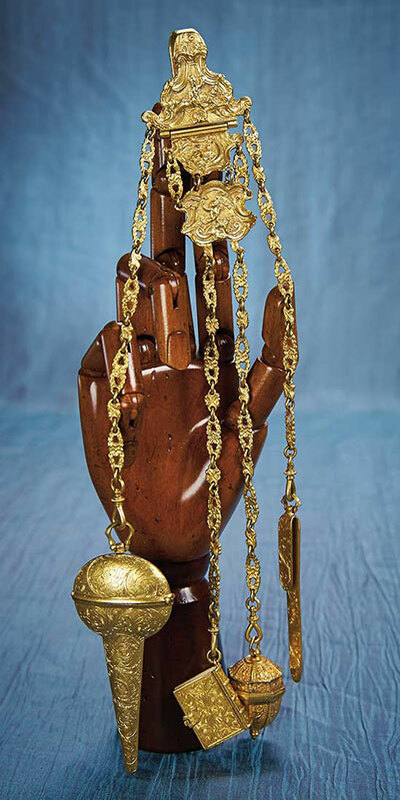 An absolutely exquisite chatelaine! It’s gilt, features mythological scenes, is about 11″ long, and it has some really nice accessories attached to the ends – one of which is a teeny tiny little journal. I probably don’t have to mention that I want it. 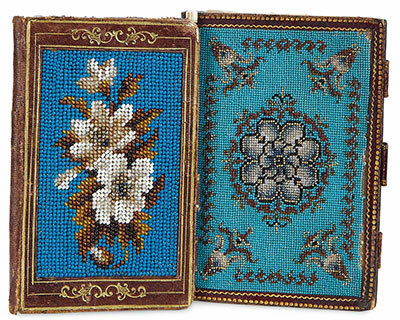 For bead embroidery enthusiasts, this lovely pair of notebooks with beaded covers might tickle your fancy! They tickle mine silly. I want them. But you know, I could pass on all the previous items, if I could have just this one piece. It’s an asparagus etui. It’s 5.5″ tall, has a silver hinged cap on the end that you open to access your tools within, and it has one painted bug on it. I think everyone needs an asparagus etui! I don’t know why I’m in love with this piece, but for some reason, when I came upon it, it completely charmed me. The delicate painting, the color, the whimsy of it – I am totally twitterpated! Well, it’s fun to browse, anyway, and I find beautiful antiques and tiny treasures like these to be inspiring. I’m thinking of embroidering asparagus on everything I see! Hope you enjoy browsing the auction as much as I did! If you want a permanent record and more detail of the pieces in this auction, you can also order the auction catalog – the link can be found at the top of each page of the online catalog. The print catalog is $49. Fun to ‘window shop’. Then you can want things without having to really make any decisions! So many beautiful things, it would be nice to be able to buy up the entire lot! Well thanks a lot Mary….just lost 2 hours looking and dreaming and drooling. But, can’t think of a better way to spend the time on a day when it’s 3 below, a wind chill I don’t even want to think about and 8″ of new snow on the ground. Better than sitting listening to the furnace kick on and off without a break!What a wonderful collection. If only we all had a long lost uncle! Wonderful, wonderful stuff!! Confirms, yet again, how IMPORTANT embroidery was/is/will be!! I think maybe we should make it the Year of the Asparagus! See how many asparagus things we/you can come up with. A friendly challenge?? contest? Thank you for the wonderful review of this upcoming event. This collection is really very unique and I welcome your readers to not only engage it on our website but, as well, see a gorgeous digital book version at http://www.issuu.com/theriaults. Thanks again, Mary for recognizing how special this auction is and for all the wonderful work you do on this site! How long will the book be available for viewing? Love the photos above, I was over on their site earlier on looking at all the catalogued items coming up for auction such beautiful embroidery tools and so many antique accessories it’s wonderful to see that such items still exist, I like so many and want so many that I had to stop looking my tongue was drooling over them. Thanks for sharing this with us so interesting such intricate detailed work. Thanks again, Mary, for showing me new sights, sites and information. The Vivandiere figure led me to bits of women’s history of which I was ignorant. Given the easy accessibility to things like needles and thimbles today, it’s hard to fathom that sewing tools used to be of such value as to have such lovely kits and holders. These are lovely, thanks for the link! That auction looks wonderful. At first I thought things were expensive. Then I remembered how much I spent buying a sewing machine. Prices are fine. Would love to be there. So much daydream inspiration! I imagine myself in a pretty little sitting room wearing an elegant morning gown, that Mother-of-Pearl Egg-Shaped Necessaire gleaming on the table beside me as I stitch. Also in my little fantasy there are somewhat more than 11 degress outdoors, the sink full of dishes are magically scrubbing themselves, and brownies have just materialized next to my always full, always hot cup of tea. How incredible is all of this? I’ve wasted (?) a lot of time today filtering through all of these auction lots. If only! Did anyone else laugh at 189 – “Early 19th Century Porcelain Needlecase in the Shape of Lady’s Arm”? I can understand the foot/shoe/boot/leg shaped ones – it makes sense that they could stand on a table… but an arm propping itself up on its knuckles? Well. I was amused anyway. Kristel, I had to go look at lot 189! For some reason it reminds me of an umbrella stand made from an elephant’s foot and lower leg. Grotesque. I think I know where I’ll be spending this afternoon, thanks Mary. These things twitterpate me too (hope you don’t mind if I borrow your word, it’s so expressive) and to my delight my darling husband responds with the occasional little gift of antique scissors (mostly) and the occasional boot button hook or needle case etc. I shall send him the link too, you never know. I would love you to have the asparagus etui, but I feel your grandmother’s sentiments may just be on the money with this one. And what a delightful sentiment it is too. I am also twitterpated over these tools. I would love to see a museum exhibit of such things, let alone add to my very small collection. I think it is time for me to go to the local antique shop and find a couple more bobbins and the darning egg I have been wanting. I haven’t looked, but it would be fun to see what gems are in the sewing room of my 94 year old mother in law. You are right, just looking at it makes me want to stitch some asparagus to add to my Fitz and Floyd bunnies. Today I did find a bargain at Tuesday Morning though and stocked up on a couple of new projects. Thanks for sharing the auction. I found it very interesting and will go back to see more of these beauties. I just read Nerylla Taunton’s book Antique Needlework tools. I believe several of the items in this auction might be featured in there. As if drooling over silk threads and good linen wasn’t enough, now you’ve ‘hit’ upon my other obsession w antique needlework tools! Somehow you always manage to find the best examples of the best. As I’m recovering from a nasty ‘bug’, this was a perfect way to while away some time. My favorite antique needlework tools are those constructed of mother-of-pearl. The necessaire on pg2 would be one of my choices. Thanks for sharing the info for this site! I cannot resist: I should think that “121. German Porcelain Needle Case As Lady’s Shapely Leg by Meissen” was awarded as a ‘major prize’ somewhere in the mists of time. There are also 193 and 86. 86 is pretty but the description “French,circa 1780,the model was known as ?jambes de puce” or ?flohbein” in reference to the tiny flea design that is incorporated into the painting” is off-putting. Of course you want them! They’re so pretty! So romantic! It’s fun to browse the catalog, too, because I’m seeing things I didn’t even know existed. And so beautiful! I wonder how a woman came by the asparagus etui? A gift? A commissioned item? Was there a fabric and notions shop where such things were sold? I wonder if these beautiful things were actually used? They don’t show signs of use, that I can see from the photos, but maybe they were. Thank you for sharing this, Mary!